Scientists from the ATLAS and CMS collaborations at the Large Hadron Collider (LHC) at CERN have for the first time directly observed the production of the heaviest of all elementary particles, the top quark, simultaneously with the Higgs boson. Groups from DESY played an important role in the analysis of both experimental collaborations. This observation is a huge step for particle physicists in understanding the mechanism that gives elementary particles their mass. Scientists presented their results today at the opening of the LHCP scientific conference, one of the major conferences in the field, taking place in Bologna, Italy, this week. 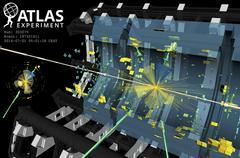 The Higgs boson was discovered at the LHC in 2012. However, a discovery is only the first step in understanding all the properties of a newly found particle. Scientists are busy unravelling how exactly the Higgs gives mass to the other particles by finding out how it interacts with them. For the top quark, the most massive elementary particle observed so far, this is especially challenging because it is very rarely – 100 times rarer that other particles – produced in association with a Higgs, and its interaction with the Higgs can only be spotted and proven by the telltale particles produced in their decays. 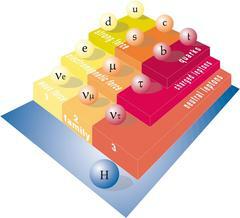 However, the top quarks interacts with the Higgs more strongly than any other particle because it is so massive. Since top top quark is so heavy the Higgs cannot decay into a pair of top quarks. Their interaction can thus only be measured by searching for the production of a top quark pair together with a Higgs. The proton-proton collision would produce a pair of top quarks, one of which an antiquark, and a Higgs boson that all decay further into other particles. The top decays into a W boson and a b quark and the Higgs decays further into for example two photons, four leptons, a b quark and an anti-b quark, or pairs of W or Z bosons or tau leptons. 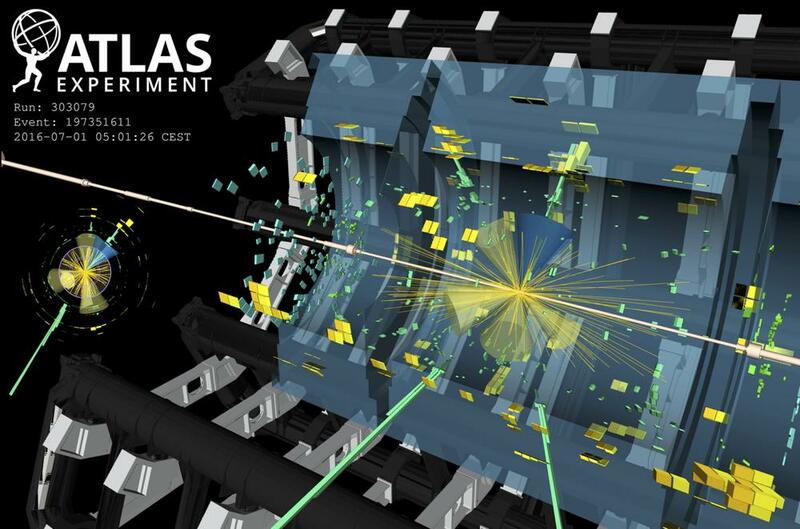 The new results, which have been obtained in a collaborative effort, exploit the data delivered so far to the ATLAS and CMS experiments by the LHC. The results from the CMS experiment are based on the data collected between 2011 and 2016, and the result has been published today by Physical Review Letters. In addition to the data collected between 2011 and 2016, the results from the ATLAS experiment use also the data collected in 2017 for the analyses in the two-photon and four-lepton final states. The results have been submitted to Physics Letters B. The Higgs boson’s decay to a b quark and an anti-b quark is the one that occurs most frequently, but is also hard to disentangle from the abundance of other particles visible in the detector during a collision. 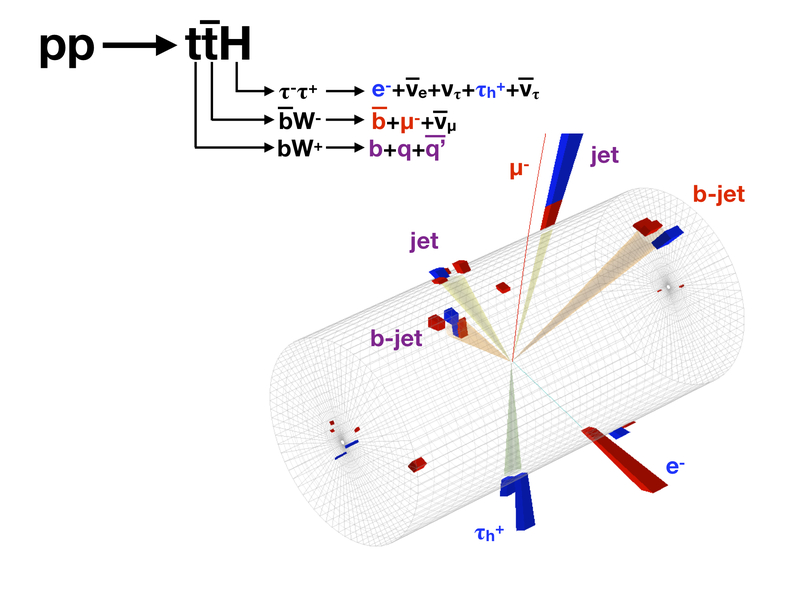 Together with other groups in the experimental collaborations, DESY scientists Maria Aldaya (CMS) and Judith Katzy (ATLAS) and their groups both concentrated on finding events in which two b quarks were produced in the final state. “The observation of the top quark together with the Higgs boson establishes this production mode of the new boson and enables us to study the direct interaction between the Higgs boson and the most massive quark. It marks another important milestone in the verification of the Standard Model of elementary particles,” explains Maria Aldaya, coordinator of the top-quark group in CMS. “To achieve this observation, the collaborations had to combine the results from the analyses of the different Higgs boson final states” says Kerstin Tackmann, who presently co-coordinates the Higgs working group within the ATLAS Collaboration. Carmen Diez Pardos, a young postdoc at DESY, was one of the leaders of the top-Higgs analysis of the CMS Collaboration. Scientists in the ATLAS collaboration, including Sarah Heim and Kerstin Tackmann and their groups from DESY, also studied other Higgs decays in association with the top quark, including the Higgs decaying into four leptons or two photons. The latter two processes are rare, but when they happen, their signal is very clear. Precisely measuring and understanding the way top quarks and Higgs interact is so critical because any irregularity in the particles’ behaviour could be an indication of something new and unexpected. So far, no deviation from the so-called Standard Model, the underlying theory that explains the properties of particles and how they interact with each other, could be detected. 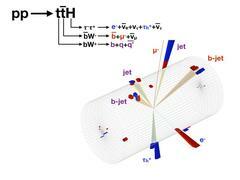 “Right now we’re happy that we’ve found this interaction between the Higgs and the top. We can now have a close look and check whether we see anything unexpected,” says Judith Katzy. Two Helmholtz Young Investigator Groups were involved in the studies: “Searching for dark matter and other new physics with the Higgs boson at the ATLAS Experiment”, run by Sarah Heim, and “Ultimate precision measurements and searches for new physics using top quarks at the CMS experiment at the LHC”, run by Maria Aldaya.